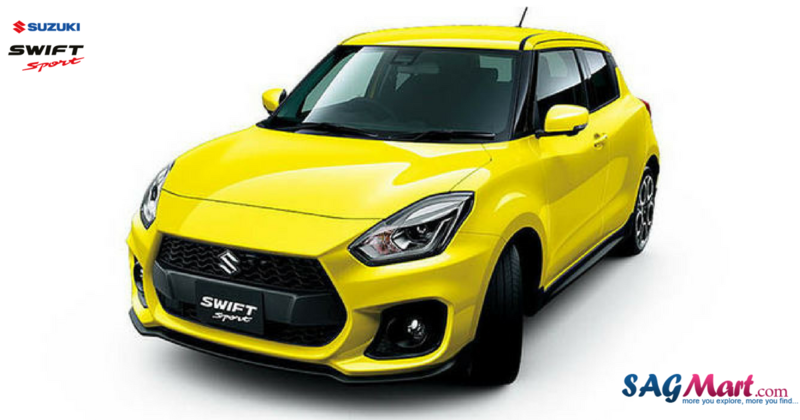 The Japanese car manufacturer, Suzuki Motor unveiled the new 2018 Suzuki Swift Sport at Frankfurt Motor event. The new car is light weight (970 kg.) than older swift by 80kg But the engine is very agile making it a super fast car with enticing hatchback look and sporty performance. The cool and sporty hatchback occupies 3890 mm in length (of course, 50mm longer than the predecessors), 1755 mm in width, and 1500 mm in height. The new arrival is ready to flaunt the market by its powerful 1.4-liter BoosterJet turbo engine (derived from Vitara S) that churns out 138 horsepower along with 169 ft-lbs of torque. The engine is mated to a six-speed transmission and the car has rational power-weight ratio, which makes it a cool performer among its rivals. The sporty look of the new Swift Sports is backed by a fresh front end which comprises new bumper, a large front grille and a front splitter along with similar front roofline. While, the rear gets a diffuser. Other highlights include large alloy wheels and lower side skirts. When we move inside, the interior gives an even apportion and same satisfactory experience sporting the sporty look and powerful quick engine of the Swift Sports. Inside gives a relish feel with cushioned sports seats, a flat steering wheel, an infotainment system and red finish entirely exposing the smart sporty look. The company is going to launch ‘Maruti Suzuki Swift’ in India by February 2018. Although Indian can enjoy last launched Maruti Suzuki Baleno rides till the new launch.